Fanfiction, while exceedingly popular, can often get a lot of scorn from authors. I think this is ridiculous. There’s a long history of re-imagining established stories and characters in literature. All the famous Greek playwrights wrote in one sense, fanfiction in that they took well known stories and characters and made them their own, creating new adventures or re-imagining older ones. In fact, I’m willing to go beyond just saying fanfiction is not a problem and people ought to write fanfiction (if they are inclined to). With one caveat though: Always respect the authors’ copyrights. Don’t steal work and illegally sell stories based on their characters and worlds. Making money off other people’s work is wrong. But when done properly, there’s definitely five great reasons to consider writing fanfiction. Fanfiction in some ways makes things easier for a beginning writer. It supplies the world building and the characters ready made. Sometimes it even provides plot, big events happening in the mainstream story that you can use in your own re-imagining. When trying to write for the first time, it can be overwhelming to create everything you need on your own. Trying fanfiction allows you to practice writing and gain skill in it with the support of elements you know are solid. I think of it a bit like tracing when learning to draw. Or copying masterpieces in learning to paint. These common exercise are used to educate beginning artists in how to do things right. It helps you learn to pick out elements in your own work that need further development when you compare them to your favorite stories. Much of my earliest writing was Redwall or Star Wars fanfic. When I look at it, I can see ideas that I added to these worlds that were good strong ideas. Later on I kept some of those concepts and characters that originally came out of fanfiction and developed them further into original stories. Another common problem beginning writers struggle with is believing your story is good enough to actually get to the end of it. Often writers will abandon a project because somewhere along the way they lost faith in it as a good idea. This can happen with any story, even fanfiction, but I’ve found that where fanfiction differs is you have the original story that excited you no matter what. You love something about this world or these characters, something about it got you so excited about it, you weren’t done when the story was over. You wanted more. Your brain is giving you more, filling in new ideas about what these characters are doing or how this world is changing. I find it easier to hold onto my confidence in the characters and the world when it’s so obvious popular with many people. This can help the writer stick with the story longer and thus learn more from writing it. When you’re starting out as a writer, getting feedback on your work is essential. It’s the biggest way you learn and grow as a writer, to hear reader comments about how you can improve. However, as anyone who is a writer knows, it can be pretty difficult to get anyone to read your stuff. Friends and family get tired of you begging them to, and often don’t give good feedback. Joining critique groups is quite helpful, but sometimes you end up in groups where the people critiquing you don’t have the same interests in reading as you do. You might find what you’re critiquing in exchange just as boring back. While you’re all writers, you have different tastes. With fanfiction you have an immediate community with other fans. These people are just as excited about this particular world and these characters are you are. They’re eager to read it. You’ll find their writing more exciting as well as it features the same things that excite you. On a fanfiction forum you can meat lots of people to share and connect with and to give you thoughts and reactions on your writing. It’s a fantastic way to grow as a writer. If you have an active fanfiction community and fans who enjoy your work, sometimes that can carry over to your original work as well. These people know and love your fanfiction. They like your treatment of characters and find your style interesting. It’s also likely that your original work will have lots of the elements of the established worlds you love. I’m not saying copying, but more like they’d be in the same genre. My original books aren’t copies of Redwall or Star Wars anymore, but you can see the influences in things like animal characters, complicated family relationships, a hero on a quest to save his home or country, and other larger themes. Many of the people read your fanfiction will likely enjoy your original work as well. Several authors have had success publishing original stories after having a large number of fans of their fanfiction work. It helps you to build up a platform from which you will eventually sell your own work. Now, just to be clear, I mean LEGALLY, not trying to sell stories still under copyright. There’s several ways you can do this. First, some older properties are no longer under copyright. Notably, recently copyrights expired for Sherlock Holmes and Treasure Island. You can now legally write stories with those characters. There’s a lot of great older stuff like Alice in Wonderland or the Jungle Book. Just double check to make sure the property you’re selling actually is public domain before you charge money for it. Sometimes, when a property is still under copyright, there are ways to get permission. If the owner of the copyright is willing to sell you or the publisher the rights, your story can be published. Peter Pan for example goes through the Children’s Hospital in the UK. Also, some larger publishers regularly put out books in various worlds like Star Trek and Star Wars. Someone has to write those books. If you’re good enough and they like your ideas, it could be you. Recently the Jim Henson Company held a contest to pick which author they’d hire for a Dark Chrystal prequel novel. If you really love the right fanfic universe, you just might be able to write in it. Just do your research about who holds the rights and the best way to legally write for them. These days, you can even self-publish in a few established worlds. Amazon has purchased the right to sell fanfiction in several worlds through kindle publishing. These copyright holders receive a percentage of your story’s income. It’s worth checking out their list of allowed worlds to write in to see if any of them are worlds you enjoy. While it’s a limited list, it ranges from something as literary as Kurt Vonnegut’s novels to as pop culture as GI Joe. Each world has rules though that have to be followed before you can publish a story with it, so make sure your fanfiction follows the unique guidelines. Hopefully more copyright holders will be interested in joining the program in the future. Now if only they got the rights to Redwall… and I might just return the field of fanfiction. Growing up, I was in love with Bill Peet’s picture books. My mother’s dislike for their “cartoony” illustrations and “preachy” messages only seemed to fuel my enjoyment of them and my desire to check them all out of the library (she would not buy us any of them). That and Babar, which she also hated. I liked the energy of Bill Peet’s pictures, especially his monsters, and the depressing tone to many of the tales didn’t bother me. 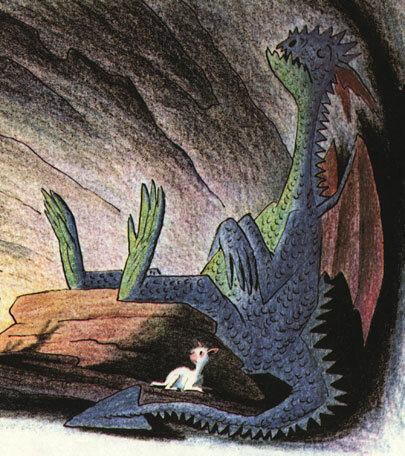 If there was anyone who knew what kids liked, it was certainly Bill Peet. My brother is lending me a bunch of books because he’s going off to college and so needs somewhere to store them for four years. One of his books, which I’d browsed when visiting him, is “Bill Peet: An Autobiography.” Since it had been good when sampling it, I asked to borrow it, and ended up reading the whole thing yesterday evening. It’s wonderfully readable, in part because each page has at least as much illustration as words, a picture book for adults. It makes the autobiography about the size of a coffee table book, but its a delight to flip through, and the text is large and easily accessible. I can’t tell if it’s meant for adults or children, in that it’s so easy to read, and yet he is so frank about adult life issues, poverty, raising children, and office politics under Walt Disney. I think it’s the sort of book anyone could read, but you get a lot more out of as an adult reader. Several things stood out to me from reading it. Bill Peet never stops drawing. He drew constantly from a young age to the present. Drawing is like breathing for him. Peet always had a back-up plan, even if it kept changing, other than working for Disney. He knew the job was unreliable and would eventually drive him nuts, even if he kept doing it for 27 years or something. It was inspiring and fascinating to hear him talk about the various back-up income plans he worked out and his failures before his children’s books took off. The main thing is, he never kept looking for a way out, the next step to what he wanted to do for his career. It makes me wonder, what goals do I want to set for myself and work? When do I give up and when to I press forward? And it makes me grateful that I don’t have Walt Disney for a boss, even if also sounds like he challenged him in positive ways. He didn’t make him sound like he was someone it was easy, or nice, to know personally. It also makes me think that I should take up drawing again. I’m the opposite in that I write constantly, and when I try to draw I give up and just write instead. But maybe if I stuck with it a bit longer, I’d be more satisfied with my work. I also feel the need to go to the library… and check out as many Bill Peet books as I can find.